It was nearly midnight before we took our station among some bushes immediately opposite the hall door of the professor. It was a fine night, but chilly, and we were glad of our warm overcoats. There was a breeze, and clouds were scudding across the sky, obscuring from time to time the half-moon. It would have been a dismal vigil were it not for the expectation and excitement which carried us along, and the assurance of my comrade that we had probably reached the end of the strange sequence of events which had engaged our attention. The hall door had slowly opened, and against the lamplit background we saw the tall figure of Professor Presbury. He was clad in his dressing gown. As he stood outlined in the doorway he was erect but leaning forward with dangling arms, as when we saw him last. Now he stepped forward into the drive, and an extraordinary change came over him. He sank down into a crouching position and moved along upon his hands and feet, skipping every now and then as if he were overflowing with energy and vitality. He moved along the face of the house and then round the corner. As he disappeared Bennett slipped through the hall door and softly followed him. 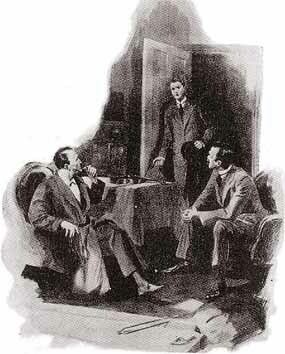 “Come, Watson, come!” cried Holmes, and we stole as softly as we could through the bushes until we had gained a spot whence we could see the other side of the house, which was bathed in the light of the half-moon. The professor was clearly visible crouching at the foot of the ivy-covered wall. As we watched him he suddenly began with incredible agility to ascend it. From branch to branch he sprang, sure of foot and firm of grasp, climbing apparently in mere joy at his own powers, with no definite object in view. With his dressing-gown flapping on each side of him, he looked like some huge bat glued against the side of his own house, a great square dark patch upon the moonlit wall. Presently he tired of this amusement, and, dropping from branch to branch, he squatted down into the old attitude and moved towards the stables, creeping along in the same strange way as before. The wolfhound was out now, barking furiously, and more excited than ever when it actually caught sight of its master. It was straining on its chain and quivering with eagerness and rage. The professor squatted down very deliberately just out of reach of the hound and began to provoke it in every possible way. He took handfuls of pebbles from the drive and threw them in the dog’s face, prodded him with a stick which he had picked up, flicked his hands about only a few inches from the gaping mouth, and endeavoured in every way to increase the animal’s fury, which was already beyond all control. In all our adventures I do not know that I have ever seen a more strange sight than this impassive and still dignified figure crouching frog-like upon the ground and goading to a wilder exhibition of passion the maddened hound, which ramped and raged in front of him, by all manner of ingenious and calculated cruelty.